With this product you can accumulate up to 130 Glitter Points. 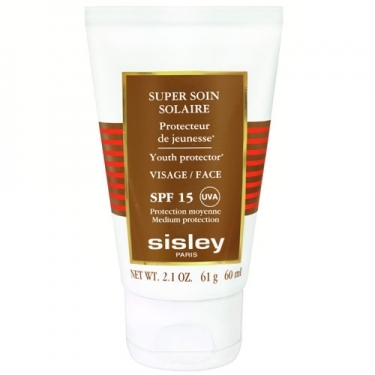 Reduces dehydration fine lines and skin discoloration caused by the sun. 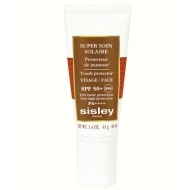 DESCRIPTION: Super Soin Solaire Visage SPF15 from Sisley is a sunscreen with high protection. This solar youth protective care (helps protect the skin from photo-aging effects) ensures anti UVA-UVB protection, ideal for skin already tanned, mattes or less sensitive to the sun. This product contains a moisturizing and nourishing formula. The shea butter, camellia oil and mango extract helps the skin to recover softness and hydration. This fine, silky, non-greasy cream merges in the skin leaving it matte. Naturally scented with their essential oils of Sage and Marjoram. Leaves no white marks. Waterproof. Non-comedogenic. Imperatively renew every two hours. Avoid excessive sun exposure. Do not expose babies and children to direct sunlight. In case of greater sunlight, use a sun protection index (SPF) higher.